Living in Edinburgh it’s easy to forget that it’s actually a pretty small city surrounded by some beautiful farmland and countryside. 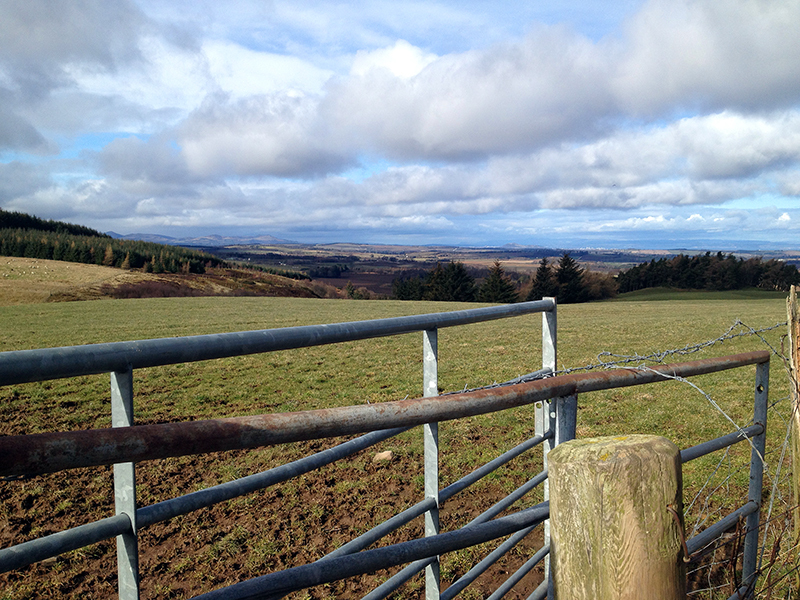 I got my first taste of rural Scotland when one of my classmates invited a few of us Botanics folk for a weekend house party at his place on a working cattle farm about 45 minutes outside of town. It was absolutely lovely to be holed up in a cozy home being plied with delicious food and drink for two days. It certainly didn’t hurt that my host is a former chef at Michelin-starred restaurants. I ate the best food I’ve had since moving to Edinburgh. It was a very late night Saturday, up many hours later than I’ve been in years. 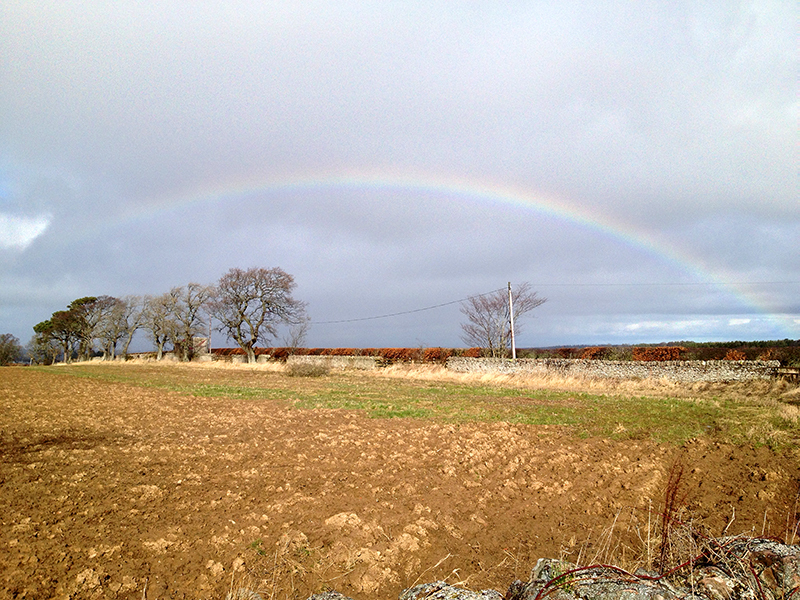 But even with two hour’s sleep a few of us rallied for a long after-breakfast walk, and I thought you’d might like to see a more rural side of Scotland. 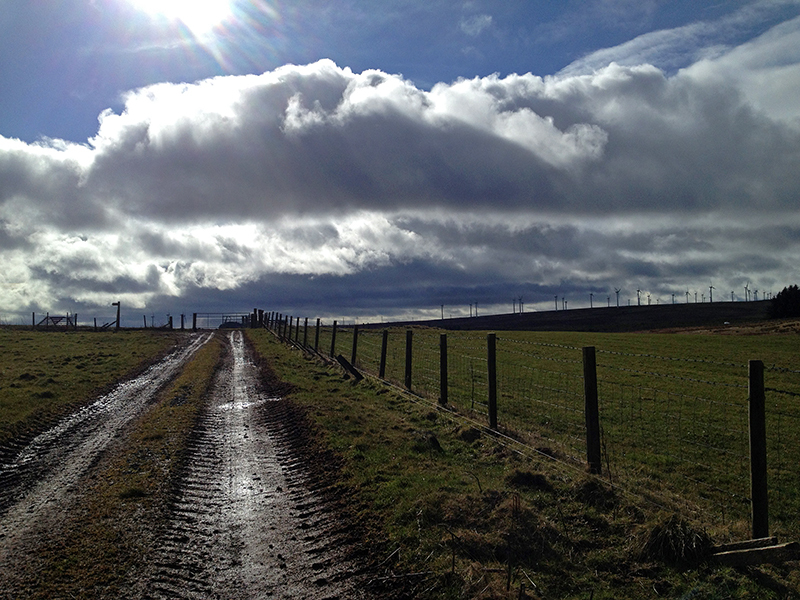 At the top of a great hill behind the farm was a wind farm, furiously spinning in the gusts. 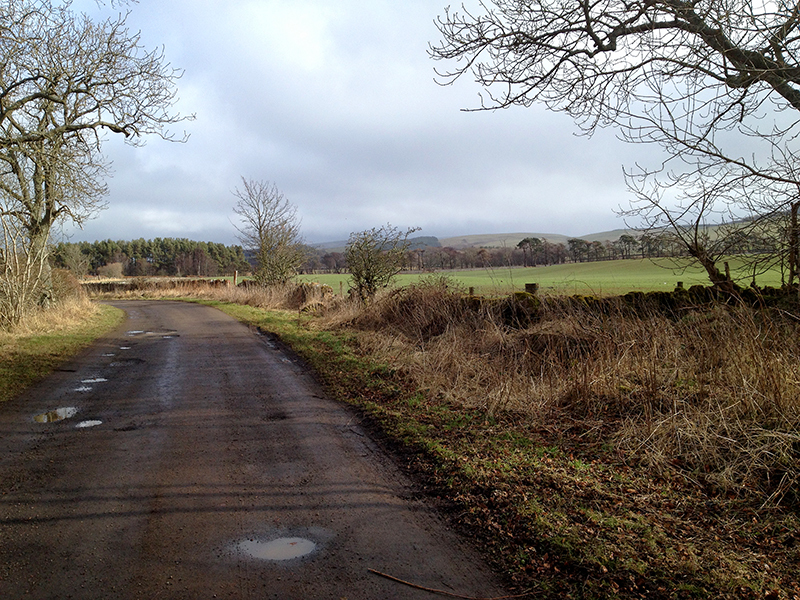 A view northwest to the Pentland Hills, at left, and over the Firth, at right. 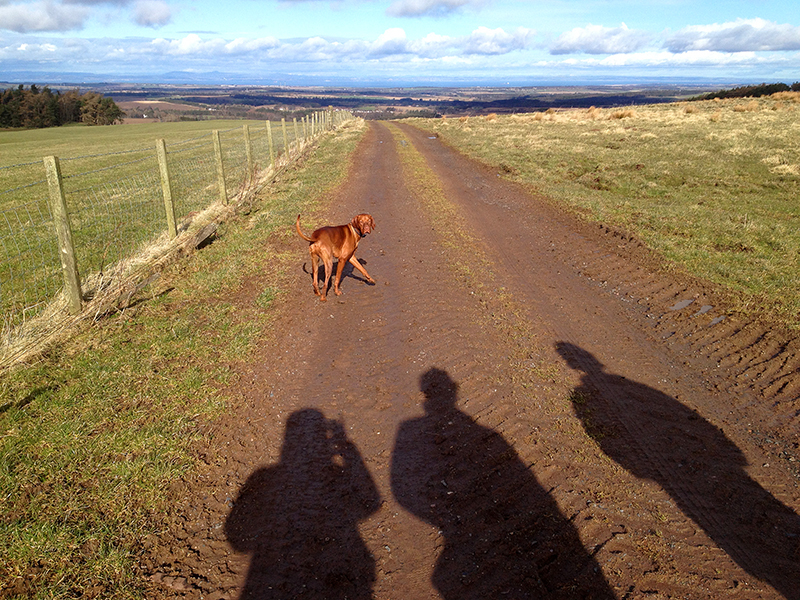 The lump in the middle distance is Arthur’s Seat. Walking back down the hill the Firth stretched out in front of us as a blue ribbon. Beyond it were snow-topped mountains. 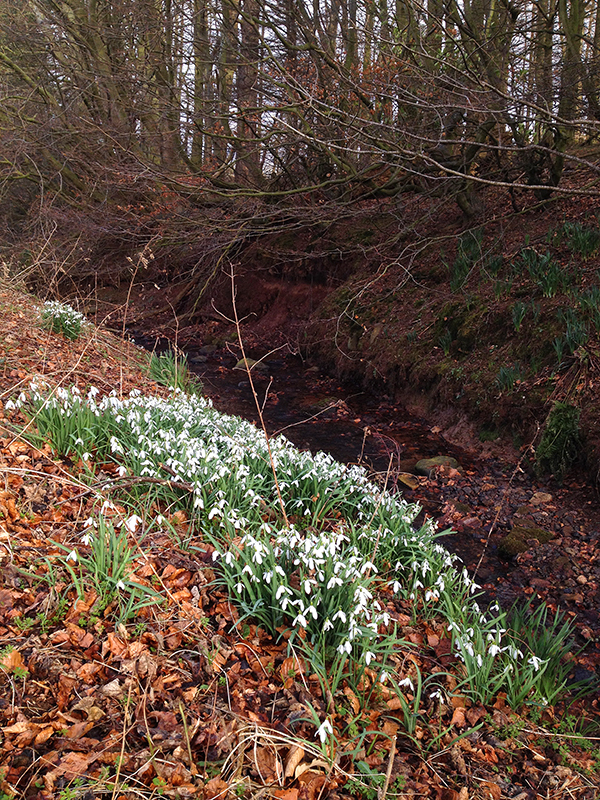 Naturalized snowdrops (Galanthus nivalis) alongside the creek, or “burn” as my Scottish friend corrected me. Beyond were thousands of daffodils just about to bloom. As we were walking along, most of our conversation was about school and plants. We kept sharp eyes peeled for plants to add to our pressed plant assignment, and it was absolutely wonderful to be in the company of engaging, inquisitive friends whose interests were right aligned with mine. Our geeky Latin-speak would have put some people off, but here we could relax and practice our new language. It was a very profound moment for me, to be able to revel in the safety and stimulation of new and wonderful companions. After a lifetime of learning about plants on my own, I am thrilled to have found my tribe. The country roads were lined on either side with beech (Fagus sylvatica) hedges whose coppery leaves glowed in the sun. Hedges are such a nice, attractive alternative to fences, and provide so much safe habitat for birds and little creatures. 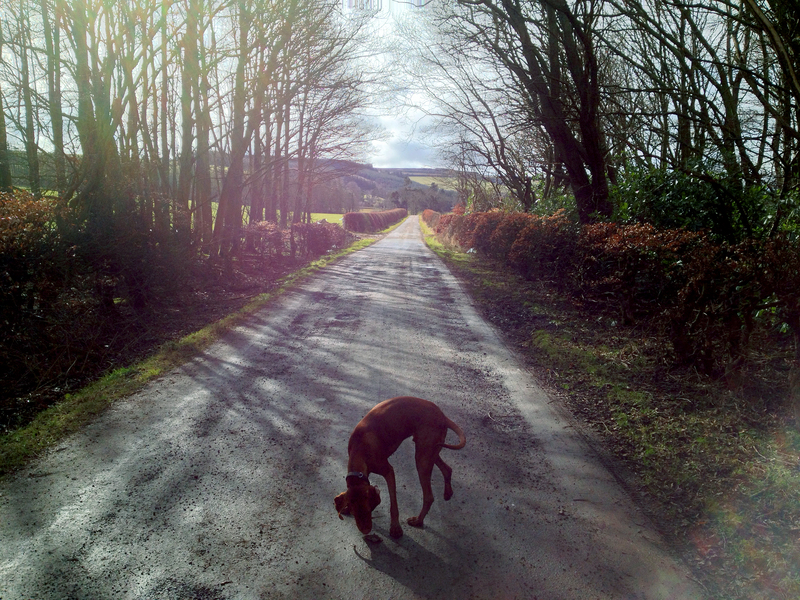 I returned from the country feeling completely refreshed, like I’d had a vacation. It was wonderful to be back in my native habitat for a bit, and to see some more of this lovely part of the world while sharing passions with some pretty cool folks. I am incredibly grateful for the experiences I am having in Scotland, and each day those experiences deepen and become more amazing as I move further into this new chapter in my life. Exciting times, can’t wait to see what’s next. I’m so glad that you’ve kept on writing. This weekend sounds like it was magical! Hi, Kate! I am so glad you’ve kept reading! Thank you! I second the writing comment. Your pictures are amazing! You are currently reading A country house party at Bonafide Farm.